I used Himal to organize a porter and book my flights to Lukla. When I arrived in Kathmandu, I went to his office, paid for the plane, received the tickets and told me a porter would be waiting for me when I arrived at Lukla airport – which he was (even though I came 6hrs late). I requested a porter that could speak some English which is what I got (around $US18 a day, and he carried the 20kg for my friend and me). He was excellent – he walked on ahead and had organized accommodation by the time we arrived in each village. 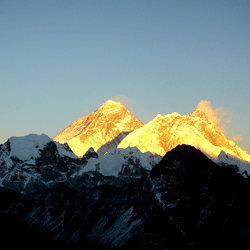 But if you need a guide or anything else in any region in Nepal, Himal can sort it out. I found him professional and efficient. Surprisingly so – it was a leap of faith to use his service as I saw him on the internet as I just needed a porter and the flights, not a whole tour and wanted to do it cheaply, on our own so we could go at our own pace. Himal organized this for us. My advice to anyone doing Everest Base Camp trek, get a porter, drink 5 liters of water a day, and add in an extra day on the trek. I added in 3 extra days, went slower and we didn’t even have a headache. I recommend using Himal. He made my trek stress free and organized everything for when I arrived in Nepal.